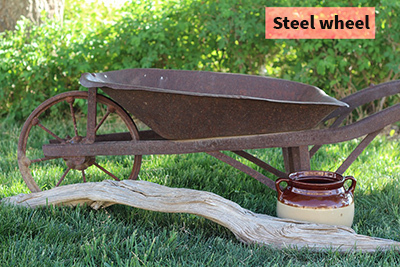 What to Consider When Choosing Wheels for the Wheelbarrows? The invention of the wheel came as a good fortune to the whole world, especially to wheelbarrow users. With time, wheel designs and materials used to make them have evolved into more effective and efficient creations. While it may seem like a small part of a wheelbarrow, the wheel plays a significant role in ensuring perfect maneuverability and in some instances, shock absorption. A wheel will roll through different kinds of terrain with no trouble only if its design is ergonomic. It suffices that it is of great importance to consider the type of wheel a wheelbarrow has before making the final decision to invest in it. Discussed below includes the different materials used in wheelbarrow wheels, their strengths and weaknesses, and how to choose the best wheelbarrow wheels. There is no limit when it comes to the material types used in the manufacture of wheelbarrow wheels. The most common materials include rubber, steel, plastic, and wood. Let’s look at each of the wheels made from these materials in depth so we can understand their strengths and weaknesses, then find out which ones are best suited for different working conditions and needs. Rubber wheels are the most common type used in wheelbarrows. Natural or synthetic rubber are the materials for them. Rubber trees produce natural rubber in the form of a substance known as latex. This latex is usually filtered to remove any impurities and water, and a dilute acid added to it to turn it into solid rubber. On the other hand, synthetic rubber is made from a combination of chemicals such as styrene and butadiene, which are derived from petroleum. This mixture is then mixed into a soap and water emulsion to solidify it. Whether synthetic or natural, the rubber will be melted, poured into wheel molds and then cooled. The manufacturer will then extract the rubber wheels from the patterns, package them and then ship to wheelbarrow manufacturers. Rubber wheels can be divided into three types depending on their design. These types include pneumatic, semi-pneumatic and non-pneumatic rubber wheels. The pneumatic rubber wheel features an air-filled tube that can be inflated by pumping air into it. It helps a great deal in shock absorption, thus offering amazing cushioning and smooth movement when traversing rough terrain. However, pneumatic wheels are often at risk of being punctured by sharp rocks or thorns. They also need to be frequently inflated to maintain constant air pressure. The semi-pneumatic wheel can best be described as the meeting point of pneumatic and non-pneumatic wheels. It takes the shock absorption property of pneumatic wheels by having air pockets within the rubber, but they don’t need to be inflated. On the other hand, it inherits the sturdiness of the non-pneumatic wheel by getting rid of the inflatable tube and replacing it with a solid rubber tire. It is ideal for both harsh, rough terrain and smooth terrain. This wheel features a sturdy solid tire that features neither an inflatable tube nor air pockets for shock absorption. As much as it will perform well in harsh and rough terrain, it does not provide ample cushioning and shock attenuation, thus not suitable for wheelbarrows used in transporting fragile loads. Rubber wheels provide excellent shock absorption, mainly if they are pneumatic or semi-pneumatic. Rubber, especially natural rubber is biodegradable thus eco-friendly. Rubber wheels can hold up to rough conditions and terrain without breaking or cracking. They are found in a wide variety of sizes and designs. Pneumatic rubber tires are prone to punctures as compared to other types of tires. 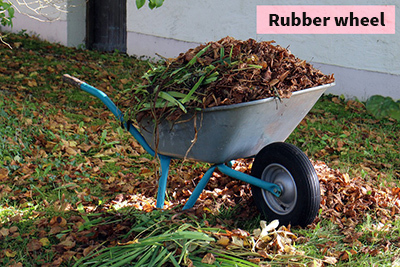 Rubber wheels are usually attached to a metal axle that acts as the fulcrum and then attached to the wheelbarrow. This design ensures strength, stability, ease of maneuverability and durability. 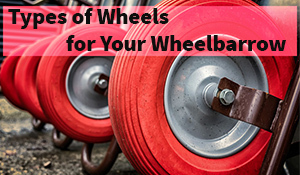 Rubber tires are used in most wheelbarrows ranging from the light-duty models used at home to the heavy-duty models in manufacturing industries. Although not as standard as rubber wheels, wheels made of steel as still present. It was the go-to material for the manufacture of wheelbarrow tires in the past and is still used in making wheels albeit at a small percentage. Steel is a compound of iron ore and coke, combined and heated in a very hot furnace. The steel is cut into sizeable sheets, which are then welded together into a circular shape with spokes emerging from the center of the wheel. The steel wheels can be made in a variety of sizes and custom designs. Steel is stable and resistant to breakage, corrosion, and rust, thus great for use in extreme terrain and weather conditions. However, it is massive, and if the wheel is not made with this in mind, maneuverability will be a big issue. Steel wheels are solid and durable. They are resistant to rust, corrosion, cracking and breakage. They are easy to repair by welding. They are safe to use on extreme terrain. Steel does not offer shock absorption, especially on rough terrain. Wheels made from steel may be substantial. Steel is not the only metal that can be used in wheels. Iron is among other metals that have worked great in this case. For wheels to be made of plastic, it means that the plastic used should not be the flimsy type used in utensils and the like. 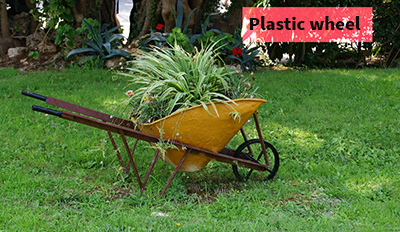 The plastic used in wheelbarrow tires is polyethylene, which is a hydrocarbon that is found in petroleum as well as natural gas. While low-density polyethylene is used in the manufacture of plastic bags and other types of flexible plastic products, high-density polyethylene is the one used in producing the stiffer and more rigid items such as wheelbarrow wheels. The wheel is creating by melting the polyethylene, and the liquid poured into molds and allowed to cool. After it has solidified, the manufacturer then extracts the wheels from the patterns, packages them and ships them to wheelbarrow manufacturers. Easy to maintain as it requires no pumping. Lightweight thus more comfortable to maneuver. Cheaper than steel and rubber wheels. They can be made in a wide variety of colors and designs. They are not prone to rust, moisture damage and corrosion. Less durable as compared to steel and rubber wheels. It offers no shock absorption. Wood is the least commonly used material in the making of wheelbarrow wheels. It is more prone to splintering especially in cases where softwood is a material. Making wheels out of wood involves getting a dried chunk of wood and using woodworking tools to curve a circular shape from it. A bore is then made at the center of the wheel where the axle frame will pass through, creating the fulcrum. The wood is then treated and finished by applying varnish, which is meant to protect it from moisture damage and ensure a long lasting existence. 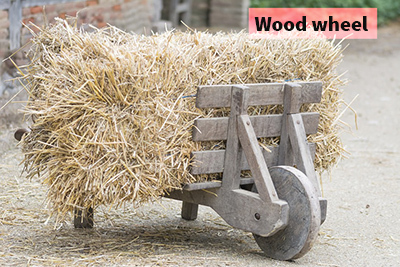 Wood is quite weak as compared to the above materials, which makes it suitable for wheelbarrows that carry lighter loads and traverse only smooth terrain. It is possibly the reason why most wooden wheels are only used on planter wheelbarrows. Wooden wheels are biodegradable thus eco-friendly. They are not prone to rust. Prone to water damage through rotting, molding, and splintering. Not suitable for use on rough terrain and heavy loads. As discussed above, each of the materials used in the manufacture of wheelbarrow wheels comes with its advantages and disadvantages. While steel may work incredibly in one area, it may not cater to other needs. Therefore, it is essential to understand your needs before choosing the best wheelbarrow wheel. You also need to check out the tips below on how to choose the best wheels for your wheelbarrows for a better understanding on which type to invest in. 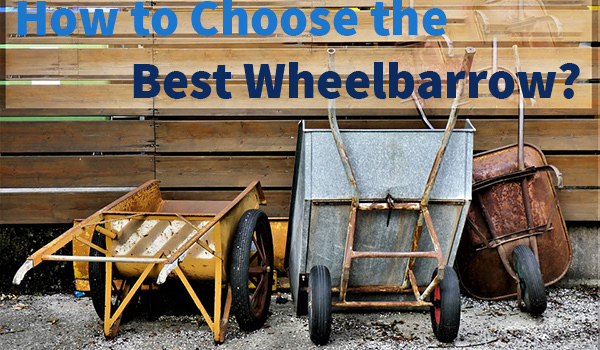 When choosing wheels for wheelbarrows, think about what you need, the available wheel options and how each may contribute to solving your needs. Combining this with the following tips will undoubtedly lead you to the right wheels for your wheelbarrow and for your needs too. These are the essential factors to consider when purchasing wheelbarrow wheels. What Type of Wheels does Your Prefer? As mentioned above, there are four main types of wheels. If you prefer a cushioned and shockproof experience, then the pneumatic rubber wheel will work for you. However, if durability is all you want, then you may have to go for steel wheels. For environmental friendliness, the wood or natural rubber wheels are your best options. 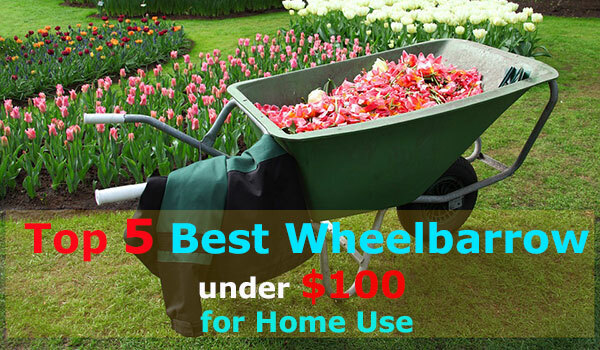 The plastic wheels are best for people who want a light wheelbarrow that is easy to maneuver. Different types of terrain call for different kinds of wheels. If you plan to use the wheelbarrow on rough terrain and require a high level of shock absorption and smoother maneuverability, then you should consider investing in rubber wheels, specifically the pneumatic or semi-pneumatic design. If durability is all you desire, then steel wheels will serve you for longer without breaking even on rough terrain and tough conditions. If your ground is significantly smooth, then you can use plastic or wooden wheels without the risk of destroying them. Once you know the size of your wheelbarrow, it will be easier to choose the right size of the wheel for it. It is no use purchasing the most expensive wheels, only to find out that they can’t fit on your wheelbarrow when it is too late. Measure the space allocated for your wheel and ensure that you leave ample space for its rotation. You should be able to find a wheel whose diameter is equal to or less than that measurement. You must also ensure that the wheel is not too small such that it doesn’t look or feel proportional to the wheelbarrow. If you are replacing your wheelbarrow wheel, then the best way to determine the size of the wheel is by measuring your old wheel’s diameter and deciding if you want one that is a little bigger or a little smaller than the old one. Different wheelbarrows come with axles of different thickness. It would be quite frustrating to purchase a wheel and find that its axle bore is too narrow or too wide for your wheelbarrow axle. For this reason, you must measure the thickness of the shaft, which should correspond to the diameter of the axle hub bore. The axle should be able to go through the hub bore smoothly without feeling too tight or too loose. You also need to measure the length of the wheelbarrow axle, and it should be a little longer than the hub length of the wheel. It prevents instances where the wheel has been secured too tightly leaving no space for seamless rotation, thus limiting the wheelbarrow’s movement. Everyone and anyone love to own something that is very easy to maintain. For instance, if you don’t enjoy the process of having to pump your wheelbarrow wheel from time to time, then you better go for a non-pneumatic rubber wheel or steel wheel. If frequent varnishing to prevent water damage doesn’t sound useful to you, then you shouldn’t bother purchasing wooden wheels. Stronger and more durable wheels are more comfortable to maintain as compared to those made of flimsy materials that will require endless repairs and replacements. The trick here is identifying what you are willing to do regarding maintenance and choosing the type of wheel that will give you the liberty to do so. Regarding repair and replacement of parts, you also need to pick the wheels that are easy to access spares, repair or even replace. For instance, wheels that don’t use bearings are more comfortable to repair and maintain as compared to those that use them. Therefore, you need to choose a low maintenance wheelbarrow wheel for a better experience. Whether you want to replace your wheelbarrow’s wheels or purchase a spare one, it is essential to understand the way they work and what features you need them to have for proper functioning. With this guide, you shouldn’t worry about coming home with a wrong wheel size or one whose hub bore cannot accommodate the axle. It helps if you take measurements carefully before heading out to shop. When it comes to durability, be sure to check user reviews and ratings so you can know if it is the right product for you. Also, make sure to ask about warranties, repairs and replacement policies in case the seller or manufacturer do not explicitly state them. This way, you won’t have a reason to regret buying that wheelbarrow wheel.